Now I don’t want to sound alarmist with my title, so please don’t freak out. I merely wish to point out an important consideration when choosing an Office 365 plan for business use. 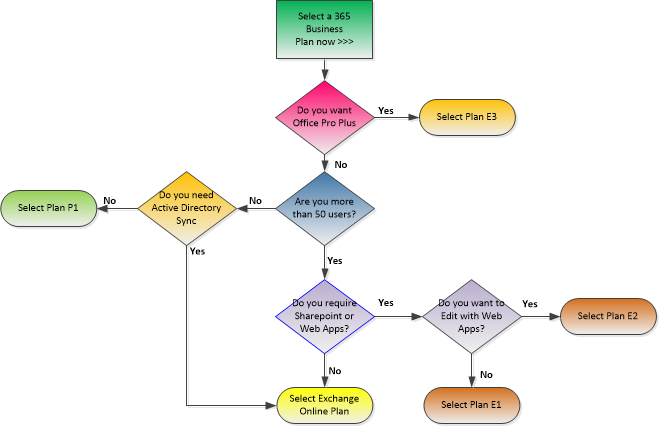 As a recap here is my Office 365 Business plan decision tree that will help you select the plan you need (click on the image to the right to see it full size). The important point to make is that Office 365 is split into what I call a Small Business stream and an Enterprise stream. Aside from one box in my tree on the left which is the Small Business Plan P1 stream, the entire rest of the tree represents the Enterprise stream or “E” plans. At $6 a user the Small Business P1 Plan is a very cost effective and enticing package that seems pretty much comparable with the Enterprise package E1 except E1 is $2 per user per month more. But they arent quite like for like. The reason I don’t want you to make a mistake is that once you choose one stream you cannot migrate to a subscription on the other side. So for instance, say you have 35 users in your business, you might sign up for the Small Business P1 package as you have no need for Directory Sync and you know will never get much bigger, plus $2 per user per month still adds up after a while so why spend it? But then all of a sudden you grow to 52 users, now you have to go to an E plan. Well you can’t just switch plans. There is no way to purchase a new E plan and simply switch over from the Small Business stream. Its a full mail MIGRATION! Yes that’s right. For you to switch you will need to migrate mailbox contents from each user, set up a new subscription, upload the mailboxes and switch over MX records – I simplify this for brevity. Now this is not impossible by any means, but it does mean considerable effort and inconvenience. You will certainly have wished you paid that extra $2. 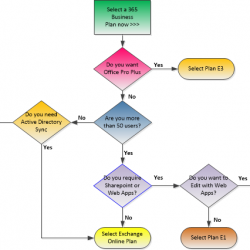 Now if you had selected an Office 365 Plan E1 plan and paid the extra $2 you will find you can move to E2 or E3 or down to just Exchange Online and back up again with relative ease once you in the “E” stream. Another discovery that will affect your choice is how you want to use Office Web Apps. If you wanted to use Office Web Apps and actually edit documents you will find yourself moving plans quickly as Office 365 Plan E1 only provides the ability to view documents with Office Web Apps but not edit. You actually have to go to E2 if you want to be able edit documents too. Microsoft does put as * next to this feature in the description but the caveat is down at the bottom of the page and easily missed. So that’s $12, or exactly double the Office 365 Small Business plan cost which does include editing via Office Web Apps. Thats a lure to the cheaper plan if ever I saw one. Its a little disappointing because you have to use a full Office install to edit files and part of the usefulness, dare I say charm of Office 365 is being able to work on documents form any device but its double the cost! If you use Skydrive the same functionality is free…but that’s another story. Small Business Plan P1 supports a maximum of 50 users – if you ever intend to have more than 50 users you should go for the E1 plan. If you are close to 50 users, go for the E1 plan. If you don’t then accept the prospect of a mail migration in the future. As stated above, its not the end of the world but will have a cost in consulting time, outages and loss of productivity. Small Business Plan P1 does not support Active Directory Synchronization – should not have Active Directory then no issue, but most companies that have a certain size Windows PC install will most likely have Active Directory. That same size user base might appreciate single sign on and a single management point. It cant be done without the Enterprise plan. If you want Office Web Apps you have to have Office 365 Enterprise Plan E2 at $12 per user, compare that to $6 for the Small Business Plan. If you have no need for point 2 and are a long way from 50 users then dont go for plan E1 stick with P1. If you are unsure which way to go, calculate how many users really need the Office Web Apps Edit ability – remember you can have 10 users on the E1 plan and 5 more on the E2 plan all under the same organization so you can minimize your costs as best as possible. What you cant do is have 5 users on Small Business Plan P1 and 10 users on E1. Try Office 365 now without requiring a credit card click here for an Office 365 Enterprise Plan E3 trial or click here for a Office 365 Small Business Plan P1. Office365forbiz.com can be your guide when moving your existing mail system to a new Office 365 platform We provide migration plans, strategic advice, hand holding and support through your migration wherever you are. Before you start a project, before you even select a plan contact us and we will help you through often at no additional cost. For more information emailinfo@squeezetech.com or call 949-287-4500.